Everyone’s favorite serial killer returns for a fifth outing through the darker side of Miami, and the theme this time is definitely family. Dexter Morgan has worked hard at fitting in: working an unusual but socially useful job as a forensic blood spatter expert, watching sitcoms to refine his understanding of normal people, working hard to keep his dark side secret while he practices “recreational homicide:” vivisecting other murderers. Dexter even became a family man with a wife and two stepchildren—but now there’s Lily Ann, his newborn daughter, and new feelings as well. You can imagine how his Dark Passenger, the fractured shard of personality that enjoys killing so much, feels about that. But time and crime wait for no one in Miami, especially a blissed-out new parent. Eighteen-year-old Samantha Aldoval is missing. The crime scene is covered with blood—too much blood, and none of it hers. The girl had been hanging out with a crew of Goth vampire-wannabes, and the son of a powerful political figure seems a likely suspect. Hard-headed Deborah, Dexter’s cop sister, is certain Samantha is still alive. The last thing Dexter wants is to get dragged into the case as her sidekick, but he can’t say no to his sister. Especially when her stubbornness is likely to get her fired. Meanwhile, Dexter’s brother Brian has returned, and neatly managed to insert himself into Dexter’s growing family. This wouldn’t be so bad, if Brian weren’t also the kind of killer Dexter normally hunts. He’s up to something; the question is, what? Things get complicated fast. 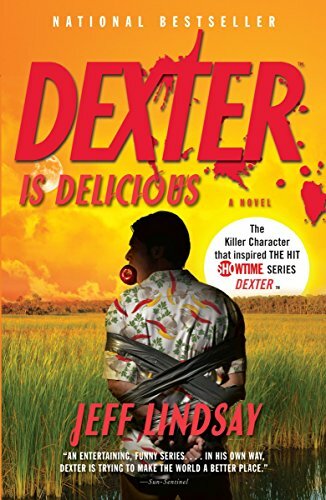 Vampires lead to, of all things, cannibals, and all too soon, Dexter’s on the menu. Has Dexter finally met someone darker than he is? Lindsay neatly contrasts sunny Miami’s steamy streets and the danger behind the scenes. Dexter’s self-deprecating honesty and constant reevaluation of his actions makes him all too human in the midst of the most horrifying behavior. After all, this is a man who watches television to learn how and when it’s appropriate to laugh. What makes Dexter so mesmerizing is how he forces us to adjust our idea of normal. After all, compared to the villains he encounters, Dexter is positively civilized. And when it comes down to basics, who’s more sane? Dexter, the vigilante serial killer with a family and an honest job, or straight-and-narrow Deb, so obsessed with catching the bad guys that she often can’t work within the system to which she’s dedicated her life? Everything about the Dexter series is completely over the top: the “hero,” the crimes, the villains, the relationships—and yet it works. And that is what makes it so entertaining.